Worried about your holiday electricity bill? Check out our list of holiday lighting tips to keep your Houston home bright for less. How can I reduce my holiday electricity usage? Breaking out your tallest ladder and plastic tubs full of tangled light strings can be exciting and frustrating. Here you go again trying to top last year’s display. You lay out all your items and begin plotting your course to make your house fill the cold winter night with glowing cheer. You may not realize how expensive powering your home’s holiday decorations can be. Don’t wait for a high Texas electricity billto compel you to reduce your holiday electricity usage. Follow these tips to keep your home festive while conserving electricity. A few simple changes can go a long way toward keeping your Houston electricity bill low. Dumping your decades old strings of lights in favor of new LED lights makes a huge difference in your electricity usage. Even if you don’t follow the other tips listed here, definitely put this one into practice. Typical incandescent bulbs consume about 7 watts of electricity per bulb. Today’s popular mini-LED lights use 0.4 watts per bulb. That cuts your electricity consumption by a factor 17.5! If you purchase blinking lights, your electricity consumption decreases even more. You know you don’t want to pick through those old incandescent light strings to find which bulbs are causing the whole string to go on the fritz. Since energy-efficient holiday lightingis easy to find at most discount stores and home improvement centers, you might not know what to do with your old sets. The cool news is that you can recycle holiday lights at the Houston Zoowhich benefits animals in the wild. Electricity consumption in Texasmakes up a sizable chunk of a household budget. But does anyone really need to see your holiday decorations at 3 a.m.? Running your holiday lights from dusk until you leave for work in the morning wastes several hours of electricity overnight. 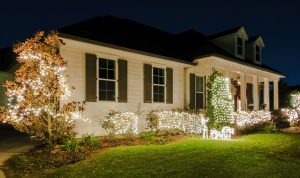 By installing timers to start and stop your outdoor display you significantly decrease your electricity usage, and you don’t have to remember to turn on and turn off your holiday lights. Setting timers can also be a nice security feature for your home. You may be attending a holiday party, but your lights come on as if the house is occupied. While lights are the main attraction for most holiday decorations, items that don’t use electricity complement electrified displays. Garlands and tinsel keep your home festive in the daytime. At night, reflective decor like silver bells and shiny ornaments disperse light in ways bulbs can only mimic poorly. And to make your holiday décor even safer, swith to using flameless LED candles. These provide the warm glow and flicker without the dangerous risk of fire that comes with using real candles. Are you paying too much for Houston electricity? If you’re worried your holiday electricity bill gives you heart palpitations, it may be time to see if a different Texas electricity provider can put you at ease. Shop electricity ratesto find out whether a new plan is right for your home. You could give yourself the Christmas present of lower electricity bills all year.